The journey of coming out typically begins with telling oneself. It involves telling friends, family, work colleagues and, for some, even random strangers who we come across in our day to day life. Some people come out once and then *POW! * everyone knows, and it’s never raised again. For others, it can start at, say, 16, and go on until they meet their maker. My story, comparatively with many, is a lot less dramatic. I realised, originally, that I was ‘different’ (to use the oldest cliché in the book) when I was 12. Many say that this is far too young an age to know such a thing, but for me, the feelings I felt towards a class mate at secondary school were too strong to be ‘just a phase you’re going through’! However, going to a Catholic Secondary school, coming out never seemed like a great option! Indeed, someone in the same class as me who was merely suspected as being gay was spurned by most of our cohort – often very violently, and this kept me very staunchly closeted – often leading me to invent girlfriends and dates. It was only when I was sixteen, in the middle of my final year, that I started to unravel the covers and reveal myself – initially to my best friend of many years, who has always remained (despite really drifting apart due to attending different colleges) really positive, and then to other close, trusted individuals. For many, coming out to one’s parents is the most difficult, traumatic and fateful seeming steps of the journey, and often I struggle to advise Young People on how to do this. This is because I never actually did it. "Rather, I was effectively ‘outed’ by my collection of Attitude, AXM and Gay Times lifestyle magazines which I had collected and which were subsequently found by my parents whilst we were clearing (or rather burning) my school books." They were, it transpired after a panicked run away to a friend’s, completely fine about it, and indeed, they seem closer to me for my being gay than they did before! After the eventful summer (during which I met, and then broke up with my first boyfriend – the first in a chain of very disastrous relationships in the space of around two years! ), I returned to my School, starting my A-Levels in Sixth Form. These two years, in terms of coming out and my ‘gay life’ were probably the most dramatic I’ve experienced so far! Not long after starting, I was ‘outed’ by a Religious Studies teacher during a discussion about ‘sexual ethics’. The news trickled out, slowly at first – simply reaching the sixth form and certain Year 11s. However, it was not long before word started getting out to the lower school. At the time, it felt like my life was an uphill battle after this. Things were fine for a while and it seemed, generally, like it wasn’t an issue for anyone. However, I then became a paid member of staff, working in the school canteen over lunch breaks and a small group of ‘lads’, aged some four years younger, decided that they, suddenly, were the best group of Catholics imaginable, and that I was to be gotten rid of, and I dreaded walking through the gates to the school. I was also, at one stage, threatened by a slightly older, and much more menacing individual – who, to the Head Teacher’s credit, was soon expelled (and I was later told was also expelled from a hairdressing course – much to my amusement!). With hindsight, the two years were actually a very positive experience. I established some amazing friendships with some individuals who I had never, despite knowing them for at least five years previously, considered talking to, and the staff were (with one obvious exception) wonderfully supportive! Since leaving Sixth Form, I have gone on to attend University and passed nearly two years ago with honours. 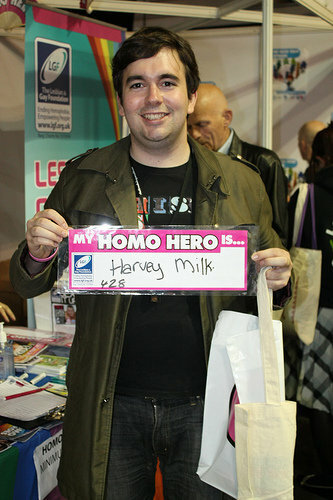 Things very much DID get better for me, not least because of my forays in to the world of LGBT welfare in Nottingham. I have, at various stages, worked with Nottinghamshire’s Lesbian and Gay Switchboard, my University’s LGBT Society (which I represented as a committee member for two amazing years), and, for the last four years, Outburst – an LGBT Youth Group in Nottingham which attracts on average forty to fifty young LGBT people from across the County every week! "I am proud to be able to think that through my work with all of these groups I have been able to help many others in their Coming Out journeys, and I shall continue to do so for as long as I have the ability to do so!"